you must take the test on a machine of 125cc, you will be limited to this until you reach 19 when you will be able to take the A2 test. the test will be taken on a machine producing a maximum of 46.6 BHP, you will be limited to this size machine until you are eligible for the A category test. this test will be taken on a machine producing over 46.6 BHP, once the test is passed you will have no limits on the size or power of the machine you can ride. Training can be run as either intensive full day sessions or open ended courses at times that suit you. The length and cost of the course will depend on any previous riding experience you may have (see pricing guide). If you already have a full licence and wish to take further training, for example after a long lay off from riding, a course can be arranged to best suit your needs. In April 09 the original motorcycle test was replaced with the E.U 2 part modular test, this basically means you need to pass 2 separate tests to gain a full licence. The 2 parts of the test are known as modules 1 & 2. Module 1- a machine handling and control test carried out at an enclosed D.S.A site. Module 2 - a road based test similar to the original motorcycle test. This option removes the risk of loosing your module 2 test fee if you are unsuccessful at module 1. The other option with this route is to simply concentrate on the Module 1 and only book the Module 2 when Module 1 is passed. Open course where you book training at days to suit you and split the course up as much as you wish and only book the practical tests when you feel ready. 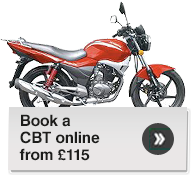 For any practical test you must have a CBT certificate and a valid motorcycle Theory certificate. Which ever route you take to your licence we provide comprehensive professional training carried out by qualified and experienced instructors who will help you every step of the way to your test. See our useful info/links for more information on the practical and theory test. The test is in two parts, the first being a touch screen, multiple choice theory test of 50 randomly generated questions. The second part is a Hazard Perception test, based on 14 videos where you have to spot hazards as they develop, you are scored by how quickly and accurately you identify the hazards. Or online at www.dsa.gov.uk and follow the links.